I consider myself very lucky. Lucky, because our little one was born precisely on her due date. Her punctuality is something only about five percent of babies experience, but did you know that about 12 percent of babies are born prematurely (defined as any baby born before 37 weeks)? Because they’re born early, preemies’ immune systems and lungs are often not fully developed, placing them at an increased risk of respiratory problems. Among those problems is something called respiratory syncytial virus (RSV). Most children contract RSV before the age of two, which usually resembles a cold, but premature babies are at a risk of much more severe symptoms. I’m ironically late in noting that November 17 was Preemie Awareness Day, but that doesn’t make the following RSV facts any less important. 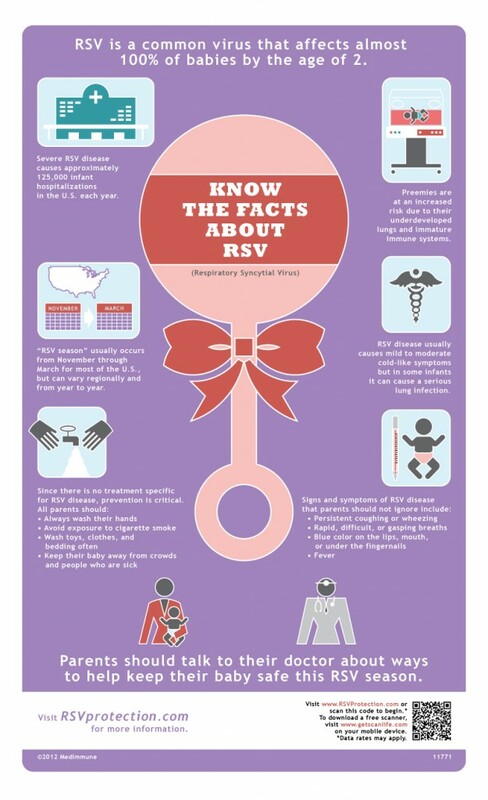 I have several friends who’ve had babies be diagnosed with RSV. I hear it can be quite scary. Thank you for providing such useful information! This is a wonderful post with great information. Thank you for sharing..
great post…we went through RSV with my youngest and it was very scary! I can’t even imagine. Glad your little one is ok! Thanks for this awesome post and great information. Passing it along to others! Thanks for sharing, David! Such an important message! great post. My niece just had a baby 6 weeks early. This is great information. It really is so scary. I’m happy to help spread the word! It’s so important that parents are aware of RSV. My son had it when he was just 8 months old. It was a terrifying experience. Getting him emergency medical help saved his life. Thank you for sharing. Oh gosh! My daughter had it around 2. I can’t imagine how scary that would be for a tiny baby! Glad your little guy is ok! How scary it must be for parents of infants with RSV! This needs to be brought to light. Thanks for informing us! I can’t imagine. My daughter got it right before she turned 2. I can’t imagine how hard it is on little babies. Mason had constant RSV which caused broncilitis all through his first year. what a nightmare!! He was almost hospitalized and he was only 2 weeks early. What a hard year. Not fun at all. RSV can be so scary! I had a January baby so I was always keeping a good eye on him. My niece did spend some time in the hospital with RSV…not fun!